'']] Galicia, until [[World War (1914-1918)|World War I]] a part of the Austro-Hungarian Empire, thereafter Polish until 1939. About 3,300 German families, including 28 Mennonite families, settled in the vicinity of [[view|Lemberg]]<em>, </em>when [[Joseph II, Holy Roman Emperor (1741-1790)|Emperor Joseph II]] invited colonization in the patent of 17 September 1781. They came for the most part from the [[Palatinate (Rheinland-Pfalz, Germany)|Palatinate]]. The oldest church record states that they came from various parts of [[Germany|Germany]], and were of Swiss origin. 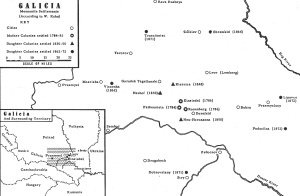 In 1784 they lived in three newly laid out neighboring communities, Einsiedel (18), [[Falkenstein (Galicia, Poland)|Falkenstein]] (7), and Rosenberg (3 families). All three places were in the county of Szczerzec (Shchirets), about three miles southwest of Lemberg. Religious services and schools for children were at first held in private homes. In 1816 a school was built at Einsiedel and services held there; in 1839 the school was rebuilt as a church. In the subsidiary congregations services were held in the homes of the preachers; some meetinghouses were also erected—Neuhof 1865, Kiernica 1860 <em>(Mennonitische Blätter, </em>1887, 39), Ehrenfeld-Blyszczyvody 1865. In 1914 there were meetinghouses in Einsiedel, Neuhof, and Kiernica. Services were held in each about six times annually. In 1909 a legally incorporated congregation was formed, called Lemberg-Kiernica. In 1911 a house was bought in Lemberg containing a chapel, a parsonage, an office, and living quarters for the chairman <em>(Kurator) </em>of the church council. In 1910 an association was organized with the name "Mennonit," to promote the cultural and social interests of the Galician Mennonites. Since in [[Austria|Austria]] civil marriages were not recognized, the ministers were obligated to keep exact records of births, marriages, and deaths, which were state documents. From the beginning of the settlement until the accession of Francis Joseph these books were kept by Catholic parish priests; but most Protestant churches kept their own in addition. The Mennonite church records were begun about 1805. They were the most valuable treasure in the Mennonite archives. In April 1913 the Galician Mennonites began the publication of the <em>[[Mennonitisches Gemeindeblatt (1913-1939) |Mennonitisches]]</em>[[Mennonitisches Gemeindeblatt (1913-1939) |&lt;em&gt;Gemeindeblatt für Oesterreich&lt;/em&gt;]]<em>. </em>World War I early prevented its publication for several years. Since in [[Austria|Austria]] civil marriages were not recognized, the ministers were obligated to keep exact records of births, marriages, and deaths, which were state documents. From the beginning of the settlement until the accession of Francis Joseph these books were kept by Catholic parish priests; but most Protestant churches kept their own in addition. The Mennonite church records were begun about 1805. They were the most valuable treasure in the Mennonite archives. In April 1913 the Galician Mennonites began the publication of the <em>[[Mennonitisches Gemeindeblatt (1913-1939) |Mennonitisches ]]</em>[[Mennonitisches Gemeindeblatt (1913-1939) |<em>Gemeindeblatt für Oesterreich</em>]]<em>. </em>World War I early prevented its publication for several years. In the 1880s and toward the end of the 19th century a considerable number of Galician Mennonite families emigrated to the [[United States of America|United States]]. They constituted the major portion of five congregations of the [[General Conference Mennonite Church (GCM)|General Conference Mennonite Church]], namely, [[Arlington Mennonite Church (Reno County, Kansas, USA)|Arlington]] and [[Hanston Mennonite Church (Kansas, USA) |Hanston]], [[Kansas (USA)|Kansas]], [[Butterfield (Minnesota, USA)|Butterfield]] and Westbrook, [[Minnesota (USA)|Minnesota]], and Perry, [[Oklahoma (USA)|Oklahoma]]. The Hanston congregation was the first, established in 1885; it bore the name "Einsiedel" 1885-1952. In 1880 and the years immediately following, 70 Galician families out of 144 left for America, a total of 369 persons out of 718 in Galicia in 1880. Pauls, H. and Cornelius Krahn. "Galicia (Poland & Ukraine)." Global Anabaptist Mennonite Encyclopedia Online. 1956. Web. 25 Apr 2019. http://gameo.org/index.php?title=Galicia_(Poland_%26_Ukraine)&oldid=91842. Pauls, H. and Cornelius Krahn. (1956). Galicia (Poland & Ukraine). Global Anabaptist Mennonite Encyclopedia Online. Retrieved 25 April 2019, from http://gameo.org/index.php?title=Galicia_(Poland_%26_Ukraine)&oldid=91842.